Saint Kabir Das (kabir, Arabic for "great", dasa, Sanskrit for "slave" or "servant"), is widely acknowledged as one of the great personality of the Bhakti movement in North India. He was as is widely acknowledged born in Year 1398 A.D.(71 years before Guru Nanak). Kabirpanthis (followers of Kabir) say that he lived upto the age of 120 years and give date of his death as 1518, but relying on the research of Hazari Prased Trivedi, a British Scholar Charlotte Vaudenville is inclined to lend credence to these dates and has prooven that 1448 is probably the correct date of Saint Kabir's demise. He is one of the medieval Indian saints of Bhakti and Sufi movement whose compositions figure in Sikh Scripture, the Guru Granth Sahib. From among all of them, Kabir's contribution is the largest, 227 Padas in 17 ragas and 237 slokas. Under each raga or musical mode marking a section of the Holy Book, Kabir's hymns appear at the head of Bhagat Bani, a generic name for the works of contributors other than the Gurus. The presence of a substantial amount of Kabir's verse in the Sikh Scripture and chronologically he being the predecessor of Guru Nanak, founder of the Sikh faith, led some Western scholars to describe him as the forerunner of Sikhism. Some have even called him the preceptor of Guru Nanak There is, however, ample evidence to prove that Guru Nanak and Kabir had ever met their periods of time in fact do not coincide. Kabir's compositions do figure in what are known as Goindval Pothis, anthologies of the hymns of the Gurus along with those of some of the Bhaktas prepared in the time of Guru AmarDas, Nanak III. They were inclucled in the Guru Granth Sahib as well But this happened much later when Guru Arjan, fifth in spiritual line from the Founder, compiled the Holy Book Besides his own works and those of his four predecessors, he entered in it hymns of some saints and mystics, both Hindu and Muslim, Kabir was one of them. Kabir lived in the fifteenth Century after Christ, which was a time of great political upheaval in India. As is true of many contemporary religious teachers, very little reliable information concerning Kabir's life is available, though there is no dearth of legend gathering around him. Kabir's life was centred around Kashi, also called Banaras (Varanasi) Legend has it that he was actually the son of a Brahmin widow who abandoned him and that he was found by a Muslim weaver named Niru, who adopted the boy and taught him the weaver's trade. It is not clear whether he ever married, but tradition gives him a wife named Loi and two children. His caste was that of Julaha and from his sayings his caste's hereditary occupation of weaving. On the basis of modern research, it seems probable that Kabir belonged to a family of non-celibate yogis converted, not long before and to a considerable degree superficially to Islam. From the writings of Kabir it seems that his knowledge of Islam was slight, rather in his poetical utterances (Bani) a wealth of Hathayoga terminology and a thought structure which bears obvious resemblance to Nath Yogis. Nath Yogis in addition to the yogic conception that all truth is experimental, i.e. to be realized within the body with the aid of psycho-physical practices, concentration, control of breathing and thus making the body incorruptible and the yogis immortal. Bhakti movement was started by hindu saints while Sufi mysticism by Muslim saints in medieval India (1200-1700). Kabir immensely contributed to the Bhakti Movement and is considered a pioneer of Bhakti along with Ravidas, Farid, and Namdev. His concept of love as a path of suffering may possibly indicate, in some measure, a debt to the Sufis. These and other elements from Nath tradition, bhakti and sufism, kabir combined with his own mystical nature and produced synthesis which is the distinctive religion of Kabir. Tradition tells us that Swami Ramanand was his Guru (a teacher). In fifteenth century, Benaras was the seat of Brahmin orthodoxy and their learning center. Brahmins had strong hold on all the spheres of life in this city. Thus Kabir belonging to a low caste of Julaha had to go through immense tough time of preaching his idealogy. Kabir and his followers would gather at one place in the city and meditate. Brahmins ridiculed him for preaching to prostitutes and other low castes. Kabir satirically denounced Brahmins and thus won hearts of people around him. There is no doubt that single most famous important person from the city of Benaras today is none other than Saint Kabir. Kabir through his couplets not only reformed the mindset of common villagers and low caste people but give them self confidence to question Brahmins. It was 100 years after him that Tulsidas broke the hegemony of Brahmins by writing Ram Charitra Manas, a poem of Ramayana at Benaras which went against the tradition of Brahmins. Kabir was in fact first person to go against Brahmins and be so successfull. Benaras was devasted by an attack by a Muslim invader Tamur Lang or "Tamur the lame" during his time. Kabir also denounced mullahs and their rituals of bowing towards kaba five times a day. Because of open condemnation of established and popular religoins, Kabir became an object of the wrath of both Hindus and Muslims in and around Benaras. Kabir travelled in and around Benaras to preach his beliefs. Kabir believed in sell-surrender and God's bhakti. The Kabirpanthis follow a lite of singing the praises of God, prayers and a simple and pure life of devotion. Kabir recommends ceaseless singing of God's praises. He virtually suggests withdrawal from the world. He is against al1 ritualistic and ascetic methods as means to salvation. It is true that Kabir refers to some yogic terms in describing the meditational and mystic methods of the yogis. But, there is no ground to suggest that he himself recommends the yogic path. In fact, far from recommending yoga, he is quite strong in condemning ascetic or yogic methods, and says that yogis, in their meditations, become prey to maya. The point wil1, however be considered further while comparing Radical bhakti with Nathism. The moral tone is quite strong in Kabir's hymns. "Kabir deck thyself with garments of love. Love them is given honour whose body and soul speak the truth." "The ruby of goodness is greater than all thc mines of rubies, all the wealth of three worlds resides in the goodness of heart. When thc wealth of contentment is won, all other wealth is as dust." "Where there is mercy, there is strength, where there is forgivenesss there is He." "The man who is kind and practises righteousness, who remains passive in the aftairs of the world, who considers creatures of the world as his own self, he attains the immortal Being; the true God is ever with him. Kabir suggests inward worship and remembrance of God. For him, true worship is only inwards. Put on the rosary inward. By counting beads, the world will be full of light. He clearly suggests moral discrimination betwecn good and bad deeds. What can the helpless road do, when the traveller does not walk understandingly. "What can one do, if, with lamp in hand, one falls in the well." "Or goes astray with open eyes. Discern ye now between good and evil." It is not surprising that Kabir's satire was brought to bear not simply on the vices and weaknesses of men but reached through and beyond them to the very system themselves. It was the authority of Vedas and Quran that more then the authority of Brahmin or Qazi which Kabir attacked. He rebelled against the pretension of resolving by the means of books or by way of authority, the mystery of human conditions and the problem of liberation (Moksha). He spent his last 40 days living in a place where it was believed that if you die you will born as a Donkey in next life. 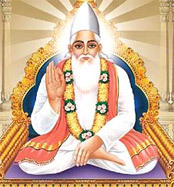 Kabir is a firm advocate of ahimsa. His doctrine extends even to the non destruction of flowers. " The life of the living you strike dead and you say your slaughter makes it dedicated. It is blood haunting you and those who taught you." "They fast all day, and at night they slaughter the cow; here murder, there devotion; how can this please God? O' Kazi, by whose order doth thou use thy knife." "When you declare the sacrifice of an animal as your religion, what else is sin. If you regard yourself a saint, whom will you call a butcher ?" "The goat eats grass and is skinned, what will happen to those who eat (goat's) meat? "Do not kill poor jiva, murder will not be forgiven even if you hear a million Puranas. Among the fifty commandments laid down for the followers of Kabir, vegetarianism is one of them. For Kabir, moral life involves adherence to ahimsa. In common with all monastic, ascetic or otherworldly sects, Kabir does not think well of women. Ihere is almost a tirade against them in the hymns of Kabir. Woman is characterised as "a black cobra', thc pit of hell and the refuse of the world." She is considered to be a hurdle in the path of thc spiritual progress of man. He spoke, "woman ruins everything when she comes near a man; Devotion, salvation and divine knowledge no longer enter his soul." His views, about woman are also evident from all his vehement attacks against maya. Almost everywhere he links maya to a woman who is out to entice and entrap man, and destroy his spiritual lifc. Such views about woman from a married person arc, indeed, quite uncommon. The cosmological views of Kabir give a clear clue to his worldview. He finds Niranjana to be the creator of the world; maya or woman. And this woman stands between man and god. She is there to entice him away from Him. Kabir composed no systematic treatise, rather his work consists of many short didactic poems, often expressed in terse vigorous language in the form of Padas, Dohas, and Ramainis (forms of poetry in Indian languages). Besides his work recorded in 1604 A.D. in Guru Granth Sahib by Guru Arjan Dev, Nanak V, and preserved inviolate since, two other collections exist - Kabir Granthavali, and Bijak. In his poems, he was quick to tell the illustrations of moral and spiritual truth in the incidents of everyday life , and many of his similes and metaphors are very striking.